Bathroom design trends change as much as trends for the rest of the home. When you’re investing in a bathroom remodel how do you strike a balance between being current but not quickly outdated? It’s also important to be able to live with the design you’ve chosen. Color is a great way of bringing a space up to date. It can be changed quite easily, and you can add color to a whole room or just introduce an accent color. Neutrals are always a reliable choice, but they don’t have to be boring. 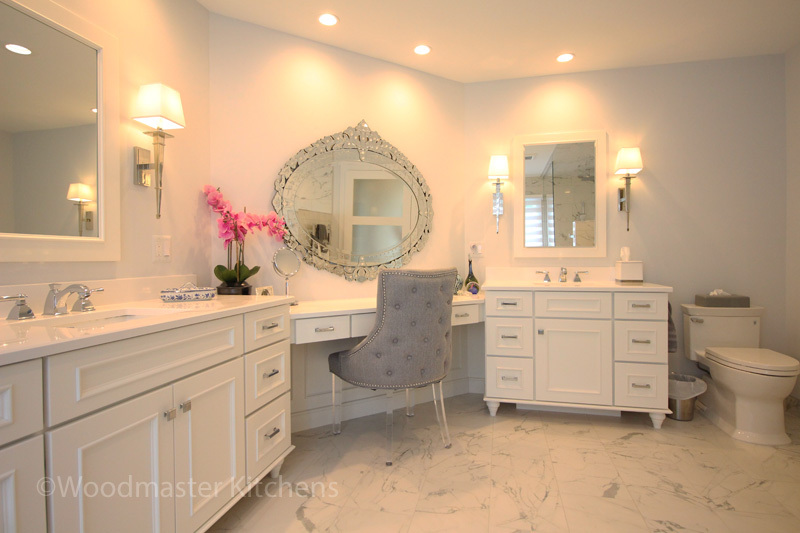 If your bathroom design has poor natural light, then this could be the color scheme for you. 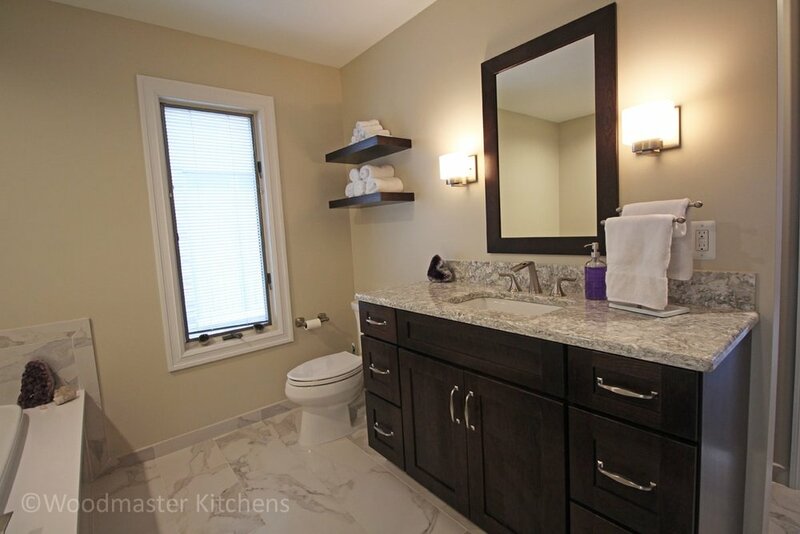 Matching greiges, creams and whites with bold earthy accent tones makes the room more welcoming like this bathroom design in Harrison Township. Or, go for a cool gray shade to achieve a sleek, contemporary look. Try this year’s spicy tones in towels, storage and accessories to accent your neutral base color. Warm wood, exposed brick and greenery is still on trend this year and work wonderfully with neutrals. Taking neutrals up a notch brings us to a hot 2019 shade, yellow. Try an accent wall, tiles, or paint the entire room your favorite shade of yellow to lift your mood. Whether you go for muted or bright is up to you but consider the light you have and what will best enhance your design and your state of mind. Pink is a massive hit this year and is the perfect opportunity for fans of neutral tones to move towards color by adding pink as an accent color. Coral works well with gray while dusky rose hues never fail with white. If you don’t want to go completely pink, add pink towels, storage containers, or other small items to perk up your room. The trend of dark walls and wood is moving from living rooms and kitchens into bathrooms. Darker tones bring richness and depth and look stunning alongside white fixtures. Stay with matte paint for walls and mid sheen for woodwork, to reflect light. Brass hardware works beautifully with dark cabinetry. Gold shower heads compliment dark tiles, which are rapidly overtaking shiny tiles. Black matte and brushed nickel fittings are very popular with white enamel. Introducing green accents with plants and accessories is always popular. Light green alongside creamy tones is perfect for a country-style bathroom remodel. Dark green walls or cabinetry need to be contrasted with crisp white or the room will be overwhelmed. You can always paint or tile halfway up the wall if you want to go bold with green. There are even updated pistachio green toilets and sinks out there if this retro look strikes your fancy, but make sure you are happy to live with this look for the long haul! 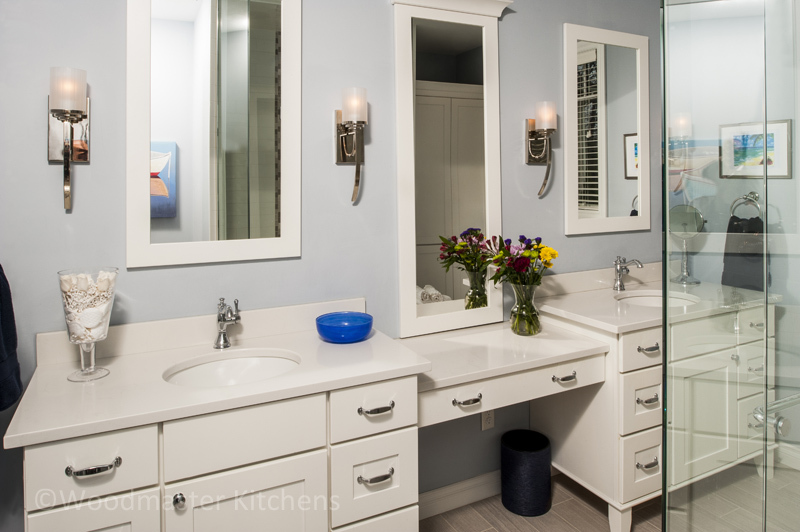 Blue is often used in bathroom design as a nautical, calming option. The key is to get the right shade. In a well-lit room, bring on the dark tones mixed with white accents to update a period look. Take a trip away from traditional light blues towards teals and royal blues to bring your bathroom right up to date. Introduce these blues onto interestingly shaped tiles to make a real statement. It’s no longer just a hair thing, ombre walls are huge this year. It’s not at all difficult to make color gradually fade up to a lighter hue. Simply add white paint to your chosen color as you move up the wall and blend with a sponge for a fashionable ombre effect. A well-designed bathroom is always complimented by carefully chosen accessories. Choose towels, rugs, candles and vases to tie in to your new color scheme and really finish your up-to-date bathroom remodel. With an abundance of great colors this year, we can help you choose what would work for your new bath design. 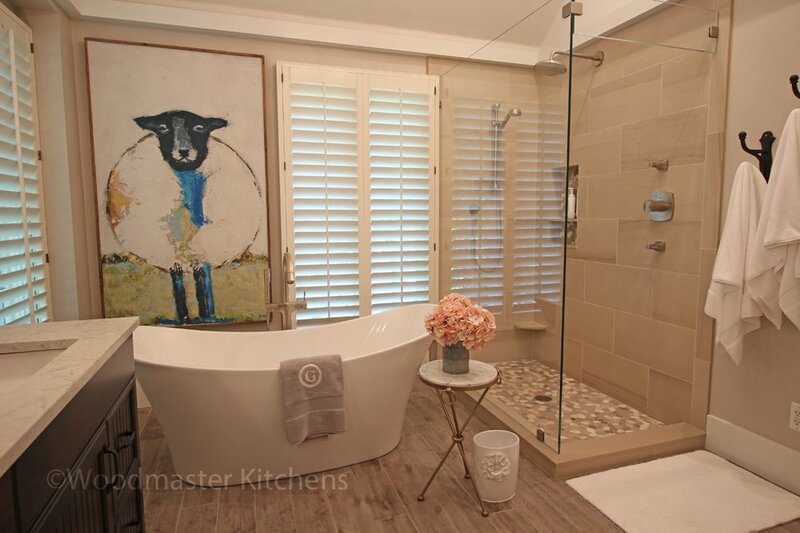 Look at our bathroom design gallery for more inspiration and contact us today to get started on your dream bath remodel.